Craighead Diocesan School offers education for students from a number of different countries. We believe that both the International Students and our domestic students benefit from the appreciation of different cultures and the opportunities that sharing in learning brings. Craighead offers a caring learning and living environment, with an emphasis on being involved in all aspects of School life and striving for excellence. Craighead has been offering excellent education to girls aged 11-18 for almost 100 years. We have an outstanding academic record in achievement for both International and domestic student and are considered one of the top schools in New Zealand. Our students have the benefit of small class sizes, quality classrooms and grounds and excellent, caring teaching staff. The School has a proud tradition of music and art, with a National Award winning choir and music tuition available through the school. Students study for their NCEA from Year 11 and have the opportunity to have individual assistance and tutor support in many subjects. They are also encouraged to pursue sporting and cultural interests over a wide range of activities. Craighead can only accept limited numbers of students at any one time. Boarding is a popular option and we offer excellent accommodation and care in the on-site Boarding House. Places are limited so early application is recommended. The School is set in large park-like grounds with a heated swimming pool and tennis courts. 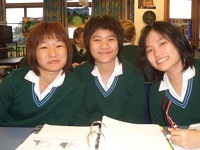 The Boarding House is at the centre of the school grounds and all students are well cared in the Boarding environment. Craighead observes and is bound by the Code of Practice for the Pastoral Care of International Students published by the Ministry of Education. Copies of the code are available of request or from the New Zealand Ministry of Education website at: www.minedu.govt.nz/goto/International This website includes translation of the Code into a number of languages including Thai, Japanese, Korean, Chinese. Further enquiries can be made directly to me at School.